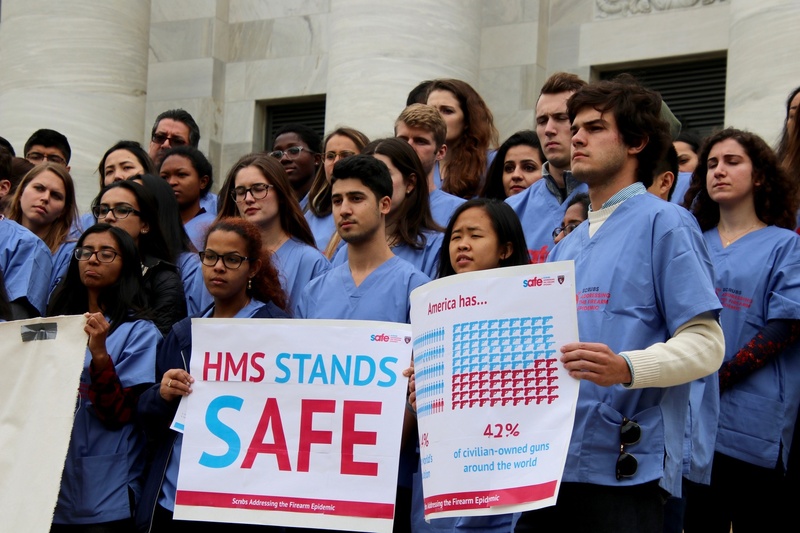 Harvard Medical School students rally against gun violence in front of Gordon Hall. 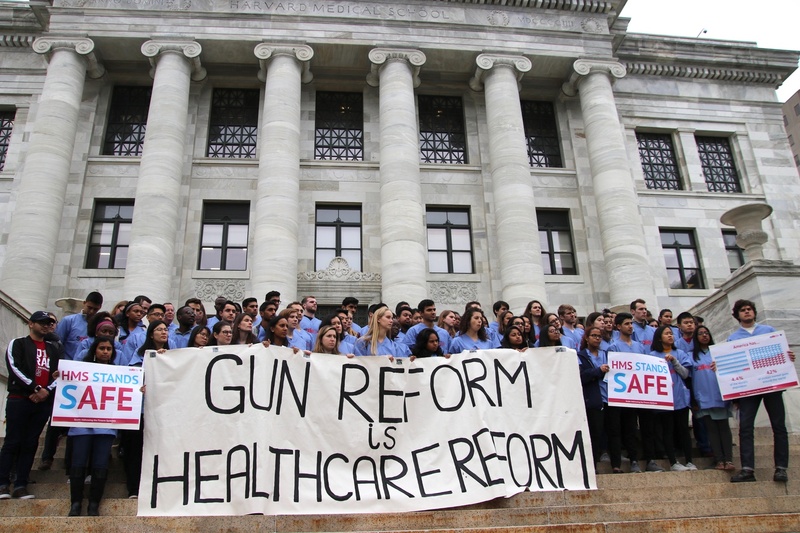 The participants, who held signs reading “Gun Reform is Healthcare Reform,” were there in support of a “Day of Action” organized by “Scrubs Addressing the Firearm Epidemic,” a national organization of healthcare professionals which advocates for “evidence-based policy” to reduce gun injuries. 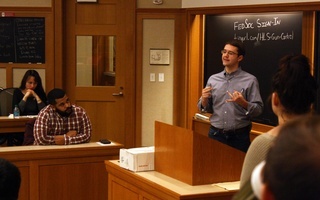 HMS Dean of Medical Education Edward M. Hundert and Dean for Students Fidencio Saldaña also participated the event, which was organized and largely attended by students. Organizers and demonstrators cited a lack of government support for research on firearms as one of the greatest barriers to productive reform. “As scientists, we're systemically prevented from studying the psychological and physiological phenomena involved in gun related violence,” said organizer Maahika Srinivasan, a first year student at HMS. Srinivasan was referring to the 1996 Dickey Amendment, which the Center for Disease Control and Prevention and lawmakers have interpreted to forbid the agency from funding any research that might support gun control advocacy. Harvard Medical School students take part in a nationwide movement in the medical community to address gun violence. “The result is that 22 years later, more than 600,000 gunshot victims later, much of the federal government has largely abandoned efforts to learn why people shoot one another for themselves and what can be done to prevent it,” Srinivasan added. The most recent omnibus federal spending bill, passed in March 2018, clarified that the Dickey Amendment does not prohibit the CDC from offering funding to groups doing research on the “causes of gun violence,” but protesters said the agency has not yet allocated any new grants for gun violence research since the update. Attendees also said they wanted HMS to focus more of its curriculum on guns and gun wounds. 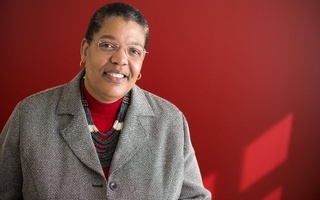 “We care about increasing the presence of firearm research ... in our curriculum at HMS. It's starting to change, but to the extent that it affects our patient population, we really do want that reflected in our curriculum,” said first-year student Fatima O. Mubarak. Monday’s demonstration was the students’ first on-campus event in coordination with SAFE, but organizers said they are already planning more. They plan to hold an informational lunch on Thursday to discuss the effects of bullet wounds. First-year organizer Raj Vatsa ’18 said he also hopes to reach out to advocates at other medical schools in the Boston area to plan future events. The zeal for activism fades when we realize policy has no healing power. What does not fade away is the need to take care of one another.